Weiwerd (Dutch pronunciation: [ˈʋɛiʋərt]) is a village in the Dutch province of Groningen. 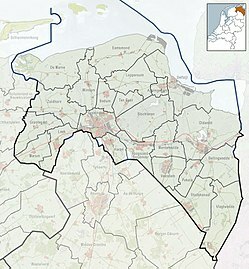 It is a part of the municipality of Delfzijl, and lies about 27 km east of Groningen. Formerly a farming community with its own church, school, and shops, the whole village was scheduled for demolition in the 1970s to allow the industrial area of Delfzijl harbour to be expand. Less than 10% of the original buildings are left. This page was last edited on 18 July 2018, at 16:16 (UTC).